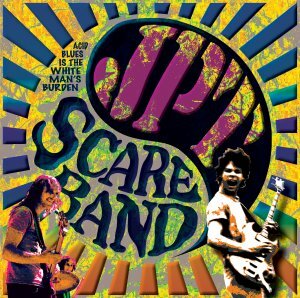 JPT Scare Band - "Acid Blues is the White Mans Burden"
JPT Scare Band started in the early 70s and, after ceasing to be a real band in the 70s, have on occasion gotten together to make some other records. This record is a compilation of tracks from 1974 up to 2004 that are on vinyl for the first time. There are some really great tracks and some not so good tracks as well. The opening track, Long Day (2001), is a really good 70s style rock song, while Not My Fault (2004) is a pretty weak song. Side B kicks off with Death Letter (2001) and follows with Stone House Blues (1975) and this is the heavy blues rock side. Stone House Blues reminds me a lot of Cactus at times. I’ve been Waiting is an old track that first appeared in 1975 on a Monster Records release. This is the third version the band has done and not the best version. The title track is next and a really cool psychedelic blues rock song. It’s a Jungle and All Lit Up are vinyl only bonus tracks both from 1979 and neither are particularly great songs. Amy’s Blue Day ends the LP and is another pretty cool track from 1974. Overall, if you are a fan of these acid blues rockers, you will find some cool tracks on this double vinyl release.